Best known for her large-scale embroidered "paintings" reminiscent of abstract expressionism, Amer has also produced a number of important installation works that use embroidered script. In Encyclopedia of Pleasure, Amer quotes a medieval written manual on sexual and spiritual fulfillment. One of a number of encyclopedias circulated around the Arab world between the 11th and 16th centuries, this one dates from the late 10th or early 11th century and was written by Abul Hasan Ali Ibn Nasr Al-Katib. It was intended as a moral and ethical guide and was considered a highly sophisticated document that combined the literary, philosophical and medical knowledge of the time. Though accepted during the time of its creation, the manual was later suppressed by an increasingly conservative society. Amer's installation is made up of 57 canvas boxes, covered with Roman script embroidered in gold thread and stacked in various arrangements. Like many of Amer's text-based works, the Encyclopedia of Pleasure presents the viewer with a challenging read. In the English translation of the original Arabic, many of the words are deliberately blurred or passages are fragmented. The text of these passages is not important per se but acts merely as the visual framework for larger investigations of sexuality and spirituality and the role of the word within them. Amer chose to copy excerpts from seven of the chapters that interested her, such as "On praiseworthy aesthetic qualities of women" and "On the advantages of a non-virgin over a virgin," both of which discuss issues of female pleasure and beauty. 2002	Ghada Amer: Reading Between the Threads, Henie Onstad Kunstcenter, Oslo. Amer, Sahar. "Encyclopedia of Pleasure." In Ghada Amer. Amsterdam: DeAppel, 2003. Auping, Michael, Valerie Cassel et al. Whitney Biennal 2000. New York: Whitney Museum of American Art, 2000. Aurrichio, Laura. "Works in Translation: Ghada Amer's Hybrid Pleasures." Art Journal (Winter): 26�37. Brietz, Candice. Ghada Amer: Critical Stands. Kassel: Museum Fridericianum,1998. Cassel, Valerie, James Rondeau, and Selene Wendt. 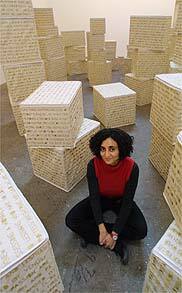 Ghada Amer: Reading Between the Threads. Hovikodden: Henie Onstad Kunstsenter. Enwezor, Okwui, ed. The Short Century: Independence and Liberation Movements in Africa. Munich, London, New York: Prestel, 2001. Ghada Amer. London: Gagosian Gallery, 2002. Kim, Clara. Unraveling Language: Ghada Amer's Art of Writing. Geneva: Guy Bartschi. Martinez, Rosa. "No Limits." Flash Art(January-February). Oguibe, Olu. "Love and Desire: The Art of Ghada Amer." Third Text 55 (Summer 2001): 63�74. Oguibe, Olu. "The Regarded Self.". In Ghada Amer. Amsterdam: DeAppel, 2003. Sheets, Hilarie M. "Stitch by Stitch, A Daughter of Islam Takes on Taboos." The New York Times (November 25, Arts section): 33. Barry Schwabsky. "Ghada Amer." Art Forum(September 1996).